Aloe vera has a wide range of benefits. Aloe vera is a succulent tropical plant that has a shape like a fleshy leaves. This leaf has many benefits, either as medicine or for cosmetics. Aloe vera is unique plant, because it contains many biologically active compounds, such as mannans acetate, polymannans, anthraquinones, and various lectins. Aloe vera also contains about 75 types of substances that have been known to be useful and more than 200 other compounds that make it fit for use in herbal medicine. These substances include enzymes that aid digestion and reduce inflammation, all kinds of vitamins except vitamin D, minerals required for enzyme function, long chains of sugar to rebalance the digestive system; saponins which act as anti-microbial, and 20 of the 22 types of amino acids. 1. Detoxification. Aloe vera juice is a laxative natural toxins, but also contain a variety of vitamins and minerals that help the body cope with stress in everyday life. 2. Digestive disorders. Aloe vera is useful especially in cases of heartburn and irritable bowel and ulcers. Aloe vera is known to soothe the esophagus and acid reflux overcome. 3. Oral health. 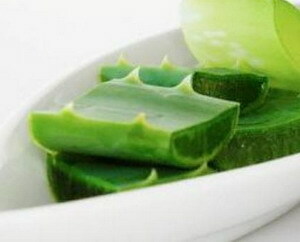 Aloe vera is very useful for mouth and gum problems, especially in improving the deteriorating gums. 4. Skin care. Functioning remove acne, moisturize the skin, detoxify the skin, scars and marks removal, reduce inflammation, as well as the repair and rejuvenation of the skin. 5. Diabetes. Half a tablespoon of aloe vera juice is given for 14 weeks was shown to reduce blood sugar levels by 45 percent. 6. Helps bowel movements. Aloe vera contains anthraquinone glycosidesaloin A and B are useful as a powerful laxative. 7. Maintain weight. Aloe vera juice has been used for years to lose weight. 8. Immunity. Aloe vera is full of antioxidants that counter free radicals to boost the immune system. 9. Burns. Aloe vera gel can heal and repair skin affected by burns, including burns caused by sun exposure. 10. Dandruff. Aloe vera can help reduce itching and dandruff. Aloe vera can also be used for the treatment of hair before shampooing.